WASHINGTON DC, Oct 1 2018 (IPS) - Stanley Kubrick’s classic 1964 film “Dr. 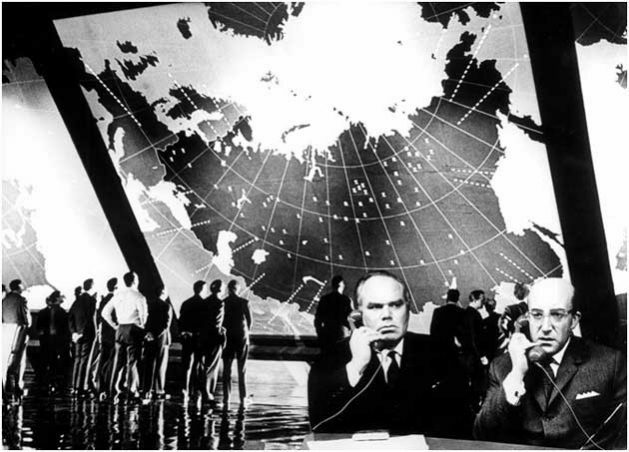 Strangelove” delivers an eerily accurate depiction of the absurd logic and catastrophic risks of U.S. and Russian Cold War nuclear deterrence strategy, but for one key detail: President Merkin Muffley was wrong when he said, “It is the avowed policy of our country never to strike first with nuclear weapons.” But it should be. Fortunately, the nuclear “doomsday machine” has not yet been unleashed. Arms control agreements have led to significant, verifiable reductions in the U.S. and Russian nuclear arsenals, the two countries have ceased nuclear testing, and they have tightened checks on nuclear command and control. But the potential for a catastrophic nuclear war remains. The core elements of Cold War-era U.S. nuclear strategy are largely the same, including the option to use nuclear weapons first and the maintenance of prompt-launch policies that still give the president unchecked authority to order the use of nuclear weapons. Today, the United States and Russia deploy massive strategic nuclear arsenals consisting of up to 1,550 warheads on each side, as allowed under the 2010 New Strategic Arms Reduction Treaty. These numbers greatly exceed what it would take to decimate the other side and are far larger than required to deter a nuclear attack. Worse still, each side maintains the capability to fire a significant portion of its land- and sea-based missiles promptly and retains plans to launch these forces, particularly land-based missiles, under attack to guard against a “disarming” first strike. U.S. and Russian leaders also still reserve the option to use nuclear weapons first. As a result, President Donald Trump, whom Defense Secretary Jim Mattis reportedly described as having the intellect of a “fifth- or sixth-grader,” has the authority to order the launch of some 800 nuclear warheads within about 15 minutes, with hundreds more weapons remaining in reserve. No other military or civilian official must approve the order. Congress currently has no say in the matter. Continuing to vest such destructive power in the hands of one person is undemocratic, irresponsible, unnecessary and increasingly untenable. Cavalier and reckless statements from Trump about nuclear weapons use only underscore the folly of vesting such unchecked authority in one person. Making matters worse, the Trump administration’s Nuclear Posture Review expands the range of contingencies and options for potential nuclear use and proposes the development of “more-usable” low-yield nuclear weapons in order to give the president the flexibility to respond quickly in a crisis, including by using nuclear weapons first in response to a non-nuclear attack. The reality is that a launch-under-attack policy is unnecessary because U.S. nuclear forces and command-and-control systems could withstand even a massive attack. Given the size, accuracy, and diversity of U.S. forces, the remaining nuclear force would be more than sufficient to deliver a devastating blow to any nuclear aggressor. In addition, keeping strategic forces on launch-under-attack mode increases the risk of miscalculation and misjudgment. Throughout the history of the nuclear age, there have been several incidents in which false signals of an attack have prompted U.S. and Russian officials to consider, in the dead of the night and under the pressure of time, launching nuclear weapons in retaliation. No U.S. leader should be put in a situation that could lead to the use of nuclear weapons based on false information. Retaining the option to use nuclear weapons first is fraught with unnecessary peril. Given the overwhelming conventional military edge of the United States and its allies, there is no plausible circumstance that could justify legally, morally, or militarily the use of nuclear weapons to deal with a non-nuclear threat. Even in the event of a conventional military conflict with Russia, China, or North Korea, the first use of nuclear weapons would be counterproductive because it likely would trigger an uncontrollable, potentially suicidal all-out nuclear exchange. Some in Washington and Brussels believe Moscow might use or threaten to use nuclear weapons first to try to deter NATO from pressing its conventional military advantage in a conflict. Clearly, a nuclear war cannot be won and should not be initiated by either side. The threat of first use, however, cannot overcome perceived or real conventional force imbalances and are not an effective substitute for prudently maintaining U.S. and NATO conventional forces in Europe. As the major nuclear powers race to develop new nuclear capabilities and advanced conventional-strike weapons and consider using cyber capabilities to pre-empt nuclear attacks by adversaries, the risk that one leader may be tempted to use nuclear weapons first during a crisis likely will grow. A shift to a no-first-use posture, on the other hand, would increase strategic stability. Although the Trump administration is not going to rethink nuclear old-think, leaders in Congress and the next administration must re-examine and revise outdated nuclear launch policies in ways that reduce the nuclear danger. Shifting to a formal policy stating that the United States will not be the first to use nuclear weapons and that the sole purpose of nuclear weapons is to deter nuclear attack would be a significant and smart step in the right direction.